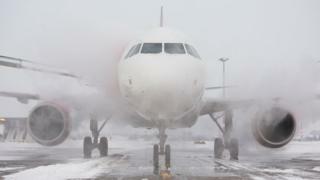 A 'flash freeze' has caused disruption to afternoon flights at Glasgow Airport. Sub-zero temperatures and heavy rain caused a rapid formation of ice on the runway and taxiways as well as roads around the airport. As a result, seven flights were forced to land at Edinburgh and Prestwick airports and four flights to and from London City Airport were cancelled. Operations were suspended at Glasgow for 45 minutes. De-icing crews were sent out to clear approaches to the airport and the airside roads and runway. A spokesman for Glasgow Airport said: "The airport is now back in operation but the issue will have a knock-on effect throughout the evening." Advice for travellers is to contact your airline before leaving for the airport. Flash-freezing caused similar problems at the terminal in November, when a 'tug' vehicle collided with a jet after skidding on black ice. Landings and take-offs were suspended for 20 minutes while de-icing crews worked to clear the stands, taxiways and runway. Six flights were diverted as a result.